Harmonics are fun sounds to produce. They can be quiet and bell-like on an Acoustic or they can be loud and squeally on an overdriven Electric. When you strike a note on the guitar, the sound generated is not just one note but a series of notes. The fundamental (also called the first harmonic) is the loudest and lowest of the series and fainter notes which all have their own frequency of vibration, amplitude, and phase are heard as well. The frequencies are integer multiples of the lowest frequency. Looking at the diagram you will notice that the upper partials (this is the name given to any sine waves associated with a complex tone) follow a pattern 2,3,4,5,6,and 7 and these equal-sized sections resonate at increasingly higher frequencies. The guitar technique described below shows how to play harmonics by lightly touching the string directly over the fret. You are essentially cancelling out certain partials from being heard by not allowing that part of the string to vibrate. Pianists have no means of manipulating strings to produce harmonics unless they lift up the lid of the piano and lightly touch the string. Woodwind instruments can produce harmonics by the technique of overblowing. It must be noted that we all tend to hear or play music as a "single sensation" and that the partials present are not considered or heard as separate during that experience. There are more harmonics than these but these are the easiest to produce and the most audible. They are ordered from lowest to highest in pitch. Natural harmonics are the easiest to produce. A good place to begin is the 12th fret of the high e string. With your fretting hand, lightly touch a finger against the string directly above the 12th fret. Do not hold it down or apply any pressure. Then strike it with your picking hand and immediately release the string; almost simultaneously. If executed properly the result should be a high-pitched, silvery note. Try it again at the 7th and 5th frets; as shown on the Natural Harmonic fretboard diagram. 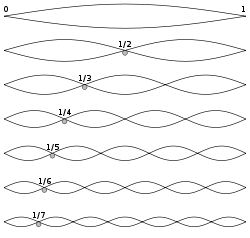 Each harmonic shown on the diagram will produce a sound that is higher in pitch than its fretted note counterpart. Harmonics will sound quieter and the higher harmonics may be nearly inaudible without the overdrive of an amp. Below are the Harmonic chords of Em and Bm. Both chords are first inversion with the third in the bass. You can play Harmonic arpeggios, add the open low E string to the Harmonic Em chord or play a melodic phrase. Below are the Harmonic chords of G and D. Both chords are second inversion with the fifth in the bass. A good example of the use of natural harmonics is in the song Imperium by Machine Head. Clear 5th fret harmonics can be heard enforcing the low drop B tuning. Pinch harmonics are also known as Artificial Harmonics though there is really nothing artificial about them. This is an advanced technique and was popularized mostly by Billy Gibbons and later Zakk Wylde, as well as many others as early as the 1970s including many Heavy Metal artists. These harmonics follow the same principles of physics as a natural harmonic; the difference being how the harmonic is produced. In this technique a note is struck in a downwards motion with the pick and in the same motion the string is touched (one might really say brushed) with the edge of the thumb that is holding the pick. You can also use the edge of the index fingernail followed by the pick. Pinch harmonics are most effective and audible using an Electric guitar with overdrive or distortion. These harmonics are virtually inaudible when using a clean (not distorted or overdriven) amp channel with the Electric guitar or when using an Acoustic. It can sound good when correctly used even without much overdrive but it's not always clear or detectable. Use overdrive or distortion for best results especially while learning and practicing this technique. This technique takes practice to master. Beginners may need to spend some time on scales, soloing, blues, riffing, strumming patterns before they feel comfortable enough to attempt this technique. It is mostly used in soloing and intense expressive riffing. As mentioned above, these harmonics are produced by striking a note with the pick and touching the string with the picking thumb. Grip the pick so that the tip barely peeks out between your fingertips (this is why they are called "pinch" harmonics). It's easier when you are fretting a note with the left hand. Try fretting the 5th fret of the D string and plucking the string just below the neck pick-up pole pieces (maybe 1/8" toward the bridge from the pole pieces). The position of the plucking along the length of the string is one of the most important parts of this technique. While with regular picking the position of the picking along the string can make slight variations in the sound of the note, when executing pinch harmonics the right position is vital and tiny positional differences can make entirely different harmonics. So try adjusting the picking hand just millimeters up and down the string around the area of the pick-ups. Try imagining the pick and your picking thumb plucking the string at the same time although the thumb is really just brushing past it. Consider it to be really one motion. Try thinking of your thumb and the pick as one entity and instead of picking straight down, pick down and a little bit (millimeters) out away from the face of the guitar so your picking motion is a sort of 'letter J' out from the face of the guitar and so the thumb brushes past the string and remember that the thumb should only touch the string for an instant just like the pick does. Try executing pinch harmonics while fretting different notes and by striking the string in slightly different places all around the pickup area of the guitar. Many kinds of harmonic ringing sounds may be produced. Without a pick, this technique may be simulated by plucking the string with the fingertip and lightly touching it with the fingernail. Classical guitarists use this technique and it is also found in jazz finger-style guitar. These harmonics, as opposed to natural harmonics, end up being much more practical to use while playing and when mastered can be used boldly like Zakk Wylde making the harmonic part of the riff, or subtly and possibly unintentionally to add color and character to the notes or chords while playing almost anything. Pinch harmonics can easily and effectively be combined with other techniques, such as bending or vibrato. Ozzy Osbourne's Ozzmosis (and several other albums) features many different examples of pinched harmonics in various solos. In the movie Rock Star at the beginning, the lead guitarist (Nick Catanese of Black Label Society/SPEED X) in Blood Pollution (the Steel Dragon cover band) is "not hitting the squeal". The squeal they're speaking of is a pinch harmonic. One of the best examples of a bend and a pinch harmonic is Judas Priest's Lochness off the album Angel of Retribution at about 1:10. Don't despair if you can't get harmonics as clear as Judas Priest or Zakk Wylde, they've got equipment made just for making sounds like that. They both have expensive high gain amplifiers and their guitars are equipped with pickups that are naturally very good at pinch harmonics. Some pickups amplify pinch harmonics better than others (some pickups hardly amplify them at all). Judas Priest and Zakk Wylde both play guitars with EMG humbuckers, which are some of the hottest pickups and some of the best at amplifying pinch harmonics. Hot pickups (EMG, Duncan JB, Duncan Live Wire, Bill Lawrence 500XL) do an excellent job of picking up pinch harmonics. Once you've practiced at home, ask to try out a guitar with "hot pickups" and a "high gain" amplifier at the local guitar shop if you want a taste(warning: it's easy to get spoiled/hooked!). This technique, like tapping itself, was popularized by Eddie van Halen. Tapped harmonics are an extension of the tapping technique. The note is fretted as usual, but instead of striking the string, the string is tapped at one of the frets listed in the natural harmonic list. Do not hold the string down with the tapping hand, just bounce the finger lightly on and off the fret. This technique can be extended by fretting a note, then tapping relative to the fretted note. For instance, hold the third fret, and tap the fifteenth fret, for the twelfth fret harmonic, because 12+3=15. A final technique (known as the harp harmonic) is a sort of combination between the natural and tapped harmonic techniques. Fret the note normally, and place the picking hand index finger on a natural harmonic relative to the fretted note (just as in tapped harmonics). Pluck the string with another finger and release the index finger, just as if producing a natural harmonic.